An exciting series of art exhibitions on (post)humanism are slated for the National Center for Contemporary Arts in Moscow, Russia. The opening show “Elective Affinities” will be accompanied by the symposium “The Human Condition in an other-than-human-world” supported by the Ministry of Culture of the Russian Federation. Contemporary curator Viktor Misiano and decolonial scholar Madina Tlostavona have invited myself and some seven other speakers. 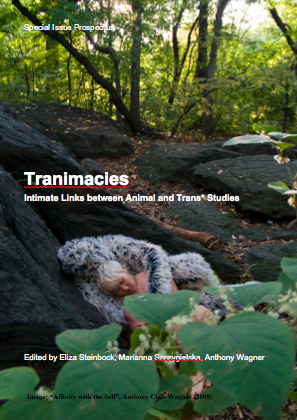 What are the possible, imagined and visceral moments of intimacy between animal and trans* studies today? Figures of trans* and animal have long been intimately linked in troubling histories of the human/nonhuman interface — specifically shaped by colonialism, capitalism, biotechnology, and the modern medical-scientific industry. I will discuss how contemporary theorists and artworks forge new transanimal alliances through the critical investigation of the “intimate links” of circulating affects that engage multiple bodies, transgender experiences understood broadly, and (human) animals held in captivity and animating theory.